IMPRESSED by nature evolved organically from a desire to preserve the beauty of nature in a wearable form. An elementary teacher by trade, Kyla has been creating pressed flower jewelry since the summer of 2011. She has always loved creating with her hands, including a thriving vegetable and flower garden in her backyard in Oakland, CA. Kyla has had a deep love for flowers from a very young age and she finds immeasurable joy in working with plants each day. IMPRESSED by nature's goal is to preserve the brief, wondrous life of a plant, in a simple and stylish way that allows botanical sublimity to speak for itself. When Kyla began making floral jewelry in 2011 using the traditional pressing technique, she was inspired by the unique character of each petal and was determined to find a way to highlight those botanical details. Using alternative materials (lightweight plastic and earthy copper), IMPRESSED by nature's designs have an effortless feel, which allows the flowers to take center stage. Each piece of jewelry begins on a locally grown plant--sometimes even from her own garden! Once harvested, the plant materials are preserved in large wooden presses for four weeks. The dried flowers are then sealed in thin plastic, making them durable and lightweight, and cut by hand to ensure their integrity. The jewelry is made using hypoallergenic copper findings to complement the natural tones in the petals and leaves. With every piece of jewelry we hope to connect individuals with nature in a beautiful, wearable form. IMPRESSED by nature offers a unique medium for wearing real floral jewelry. 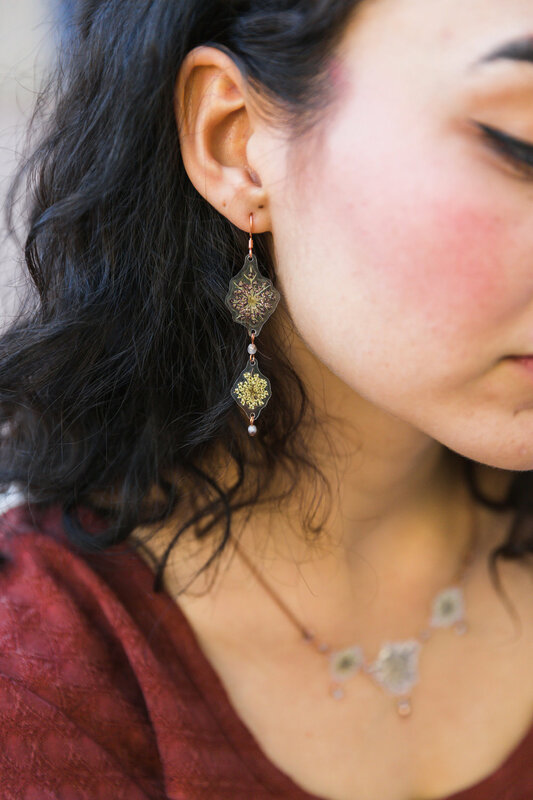 Pressed flower jewelry is typically made using glass or resin, which can be heavy, environmentally toxic, and distort the organic shape of the plant. Alternatively, using a thin, durable plastic sealant provides a very lightweight and natural looking product—as we can cut to the exact form of the petals—while also maintaining durability. From the earthy copper metal findings to the natural beads used to complement the flowers, the priority is highlighting nature. Many customers love to make a connection to the gifts they are buying; whether the rose petal earrings remind them of their grandmother’s garden or the sunflowers are their favorite flower, the focus on nature allows them to connect with the jewelry.